It was indeed the Oriental Market on 27th and T st. This is probably the best “Pan-Asian” market in town due to the diversity of its stock, but there are several other stores in town which have better selections of fresh vegetables and seafood, like the one directly across the street in Vina Plaza for instance. I took these photos with a mobile phone so they are not the greatest quality images, but still good enough to make out the location and even one’s colleagues apparently. In any case, good going Kevin! The Oriental Market on N 27th and T. Good variety of good stuff. 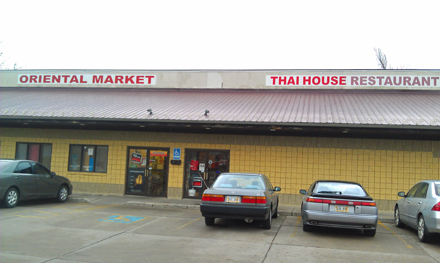 Adjacent to the Thai House. I don’t know where it is, but I work with the girl in the picture.